Chef James Dugan has come home – in more ways than one. 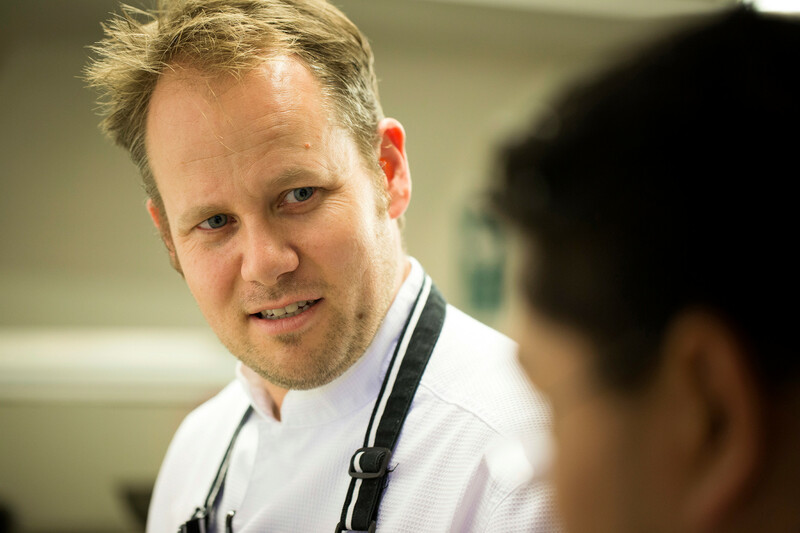 The newly appointed Executive Head Chef at Four Seasons Hampshire is both rejoining the Four Seasons family, having spent an early part of his career at Four Seasons Park Lane, and returning to his native county as a Hampshire resident. 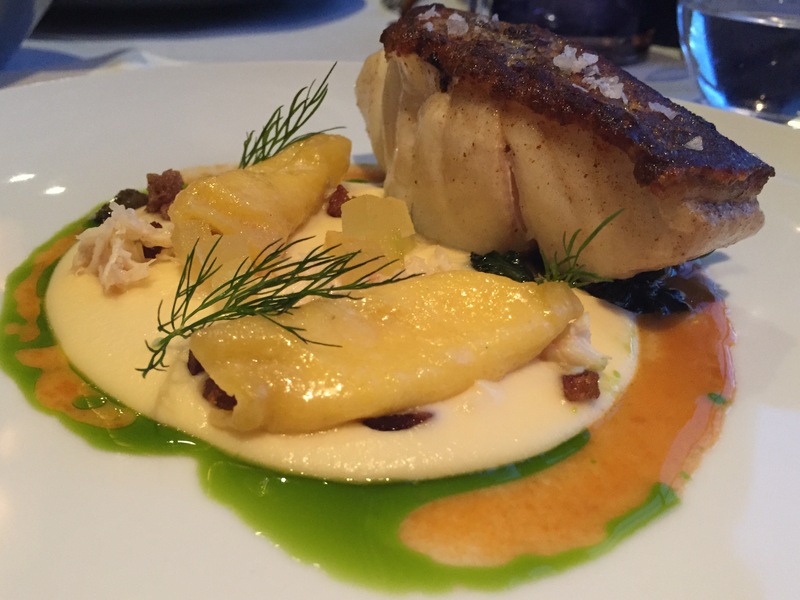 The Luxury Restaurant Guide sent our very willing Mrs Robinson over to Dogmersfield Park to meet Chef Dugan and try out his new menu. 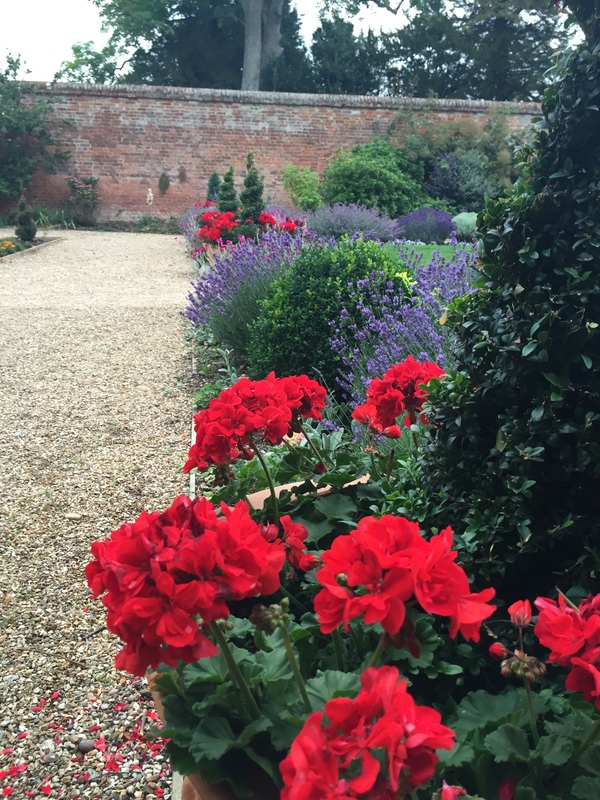 I consider myself very lucky to live just down the road from the beautiful Dogmersfield Park – home of Four Seasons Hampshire for the last 10 years. The appointment of a new chef with such provenance has had us locals and Four Seasons fans alike tantalized in expectation. It was with taste buds twitching in anticipation that Mr R and I drove the short hop and entered the stunning entrance with charming new flower meadow on our way to meet Chef James Dugan and sample his new menu. You’ve re-joined Four Seasons after being away for a stint – is it the ethos of the group you like so much? 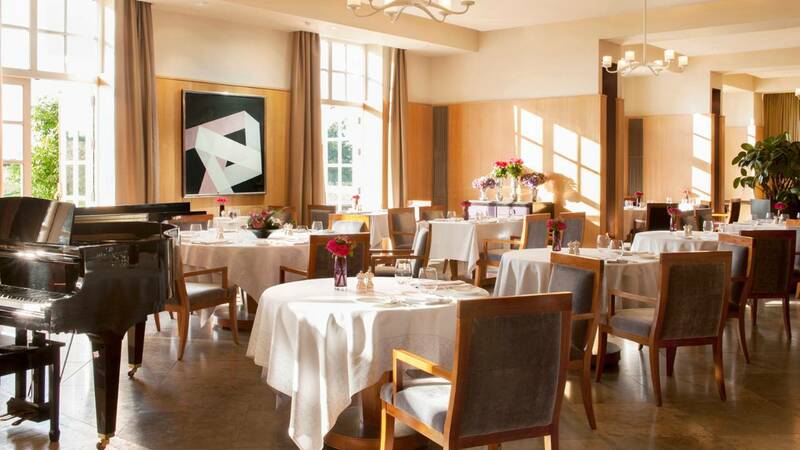 Are you working towards a Michelin star after your success with 36 on the Quay and Lindsay House? 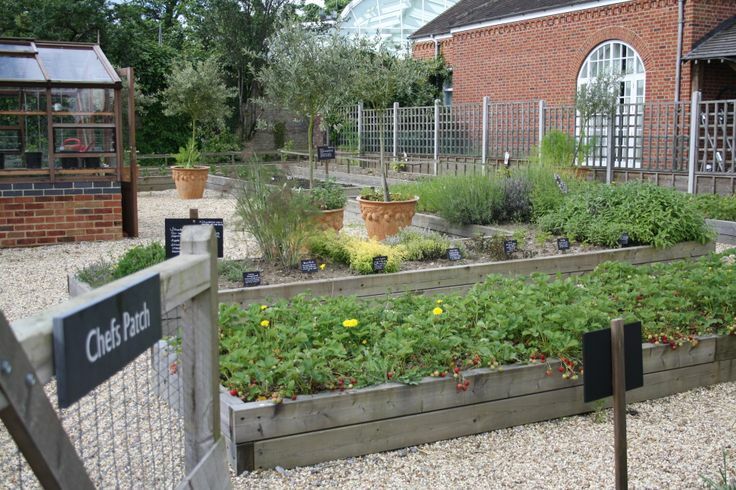 How different is cooking at Four Seasons Hampshire than Four Seasons Park Lane? Talk us through the ‘Field To Fork’ concept which FS Hampshire is promoting. Any top tips for which produce is particularly good this season? Who has been you biggest inspiration? What are your favourite places to dine yourself? What do you do to relax outside of cooking? Chef Dugan’s passion for this new challenge is palpable and he is ably assisted in the kitchen by head chefs Vincenzo Raffone (who Chef Dugan worked with at Cafe Royal) and Lee Young (formerly Fat Duck). 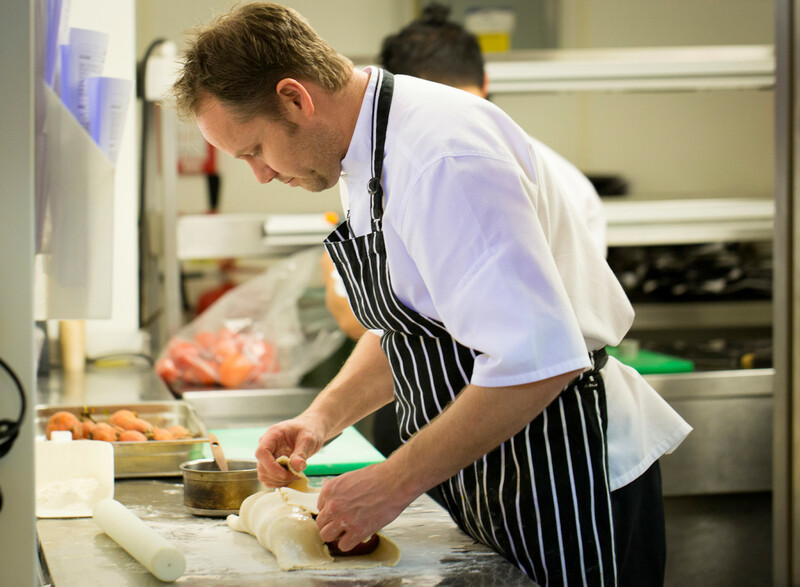 Chef also hinted at some exciting refurb working coming soon to the restaurant, bar and terrace area – watch this space. In the meantime after an indulgent conversation ranging through various chefs, restaurants, hotels (and daughters!) we thanked Chef Dugan and made our way through to Seasons – nothing like talking about food to make you ravenous! Having enjoyed several visits to Four Seasons Hampshire including breakfast, afternoon tea, drinks on the terrace and several trips to the spa, what always strikes me is the wonderful staff who are so deserving of a mention. I spend (quite) a lot of time in five star properties (lucky ol me) and the team at Four Seasons never fails to impress me. They are just so, well, lovely. Friendly, welcoming, educated, well informed and most of all they are proud and delighted that they are there – and you are there. Visiting is a shared experience of joy between staff and guest and the lovely duo who served us (Slavick and Vaclava) were no different. Vaclava recommended the chicken wings and oh how right she was. I am more starter than pudding and this was starter heaven. What to eat first – the chicken or the egg? Served with little squares of firm onion the combinations of flavour and texture on this dish were absolute perfection. The 1086 ale lent the chicken an orangy glaze and the smoked pancetta deepened the taste, with the incredible richness of the yolk adding a savoury custard which bound it all together. When I return, I will reorder. 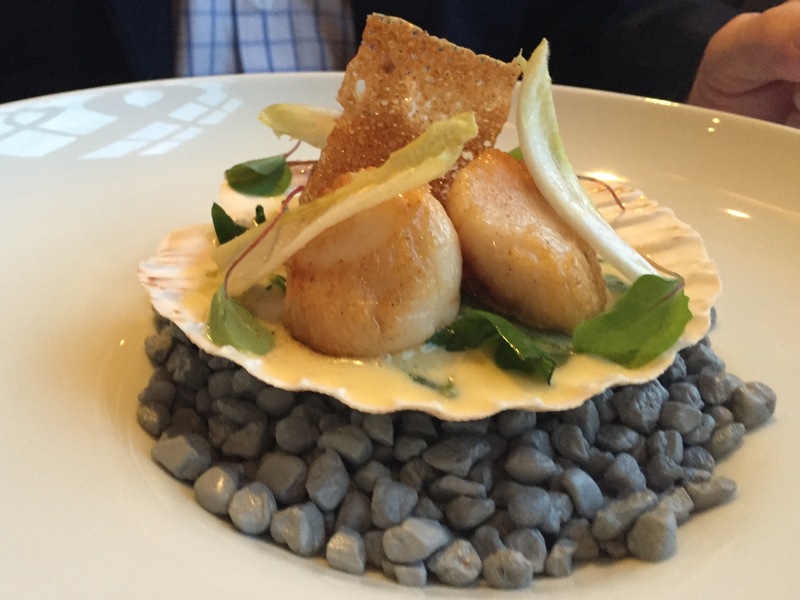 Followers of this blog may remember that Mr R loves scallops and can never pass them up on a menu. 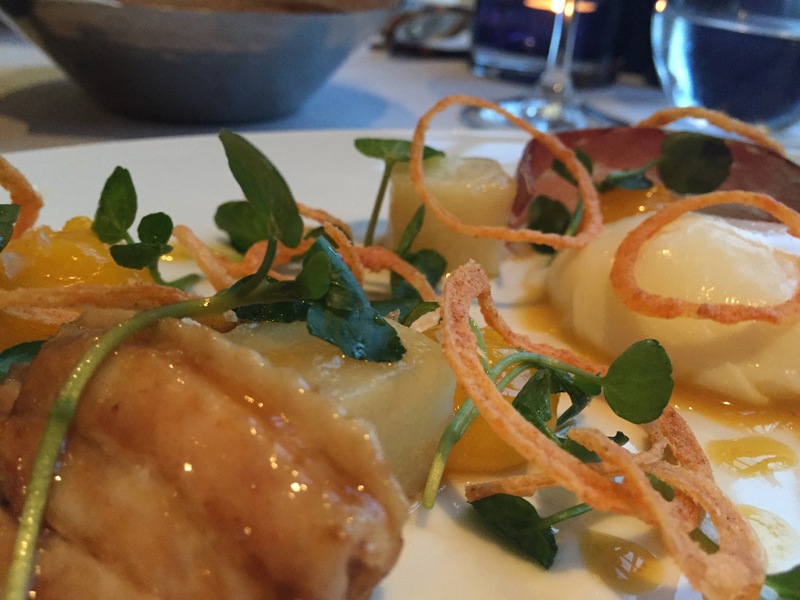 It looked amazing and Mr R effused – apparently the strong shrimp flavour ‘buttressed’ the fluffy scallops and the rich, creamy comforting praline was ‘organoleptically pleasing’. Slavick recommended a lemony light Sancerre which was a great choice and also worked very well with my main course. I am a lover of salt so this suited my palate very well – the crispy salty skin and firm flesh blended with the slightly bitter puree and then the salt kicked in again from the bed of samphire along with crispy crab flakes. It also looked beautiful with the garlic oil swirling around the fish in a sea of green and orange. 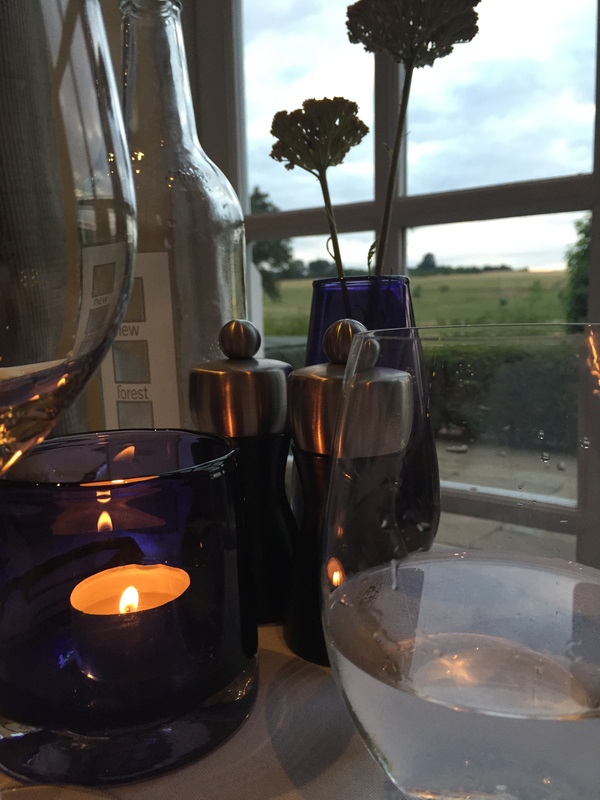 Mr R was very much enjoying the red wine Slavick had recommended as a perfect accompaniment to his lamb main course – ‘Iconoclast’ from the Napa Valley, made exclusively for Four Seasons. 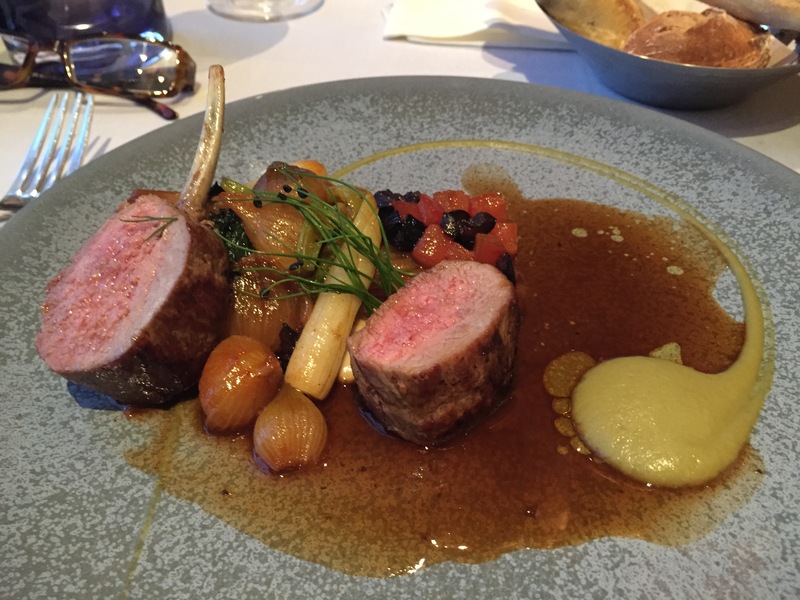 The lamb rack was ‘perfectly pink’ but it was the confit shoulder that was his star standout of the dish which he said was ‘sublime’ alongside the slick of fennel puree. Chef Dugan admitted to his cooking being perhaps ‘overly complicated’ in his early years. This is accomplished cooking, honed after years of watching, experimenting, trying and simplifying so all of the ingredients on the plate are relevant and exceptional. This was my second dish which used the Ale – we were warned they were fond of it! How versatile it is though. This dish was a curious mix of adult and childish flavours – ale and caramel working although they shouldn’t? This was my only disappointment (although it wasn’t my dish) and was simply that the cheeses were served pre-cut on a slate – rather than wheeled up on a big trolley for him to choose. This did not detract from Mr R’s enjoyment but I rather like the theatre of a large cheese board that’s all. He particularly enjoyed the Barkham Blue and the Waterloo and left the Cerney (goats cheese) for me to polish off. 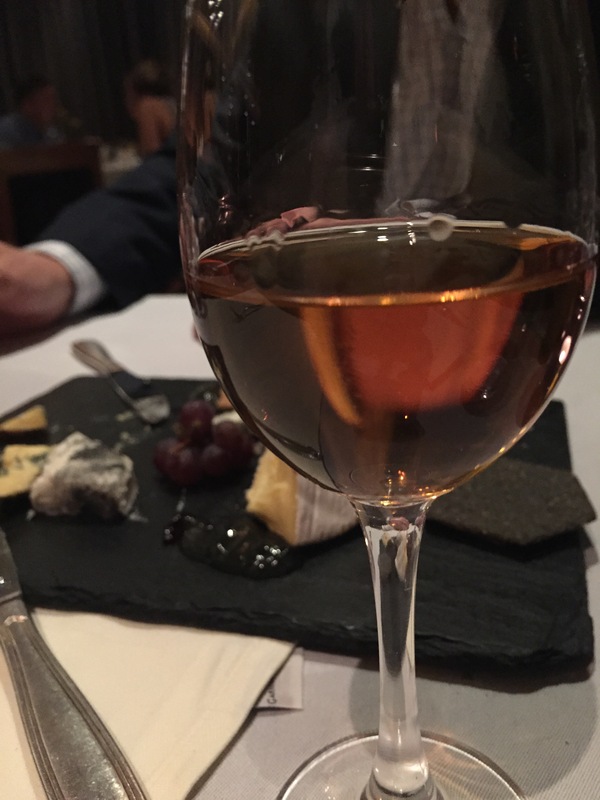 Curious to try a different wine I chose a Caldas White Port Alces de Sousa to drink with my pudding (and Mr R’s Cheese) which was a new experience for me but one I highly recommend. 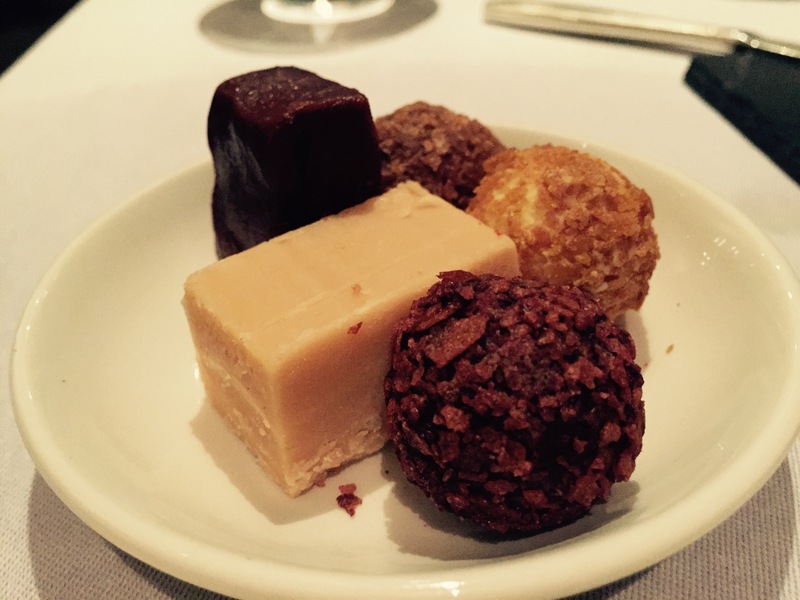 Coffee was complimented with petit fours. Our joint favourite was the delicious orange blossom fudge – creamy, light, melty with a teeny crunch – utterly divine. The air was rich with the smell of lavender as we made our way back to the car clutching our bottle of 1086 Ale (we needed to try it actually out of a glass as it were – it has marvellous honey notes). Chef Dugan has a huge playground to flex his culinary muscles in – I’m fairly sure he is going to take this ball and run with it until someone stops him – but with 400 acres to play with let them try! Mr and Mrs Robinson were guest of Four Seasons Hampshire. 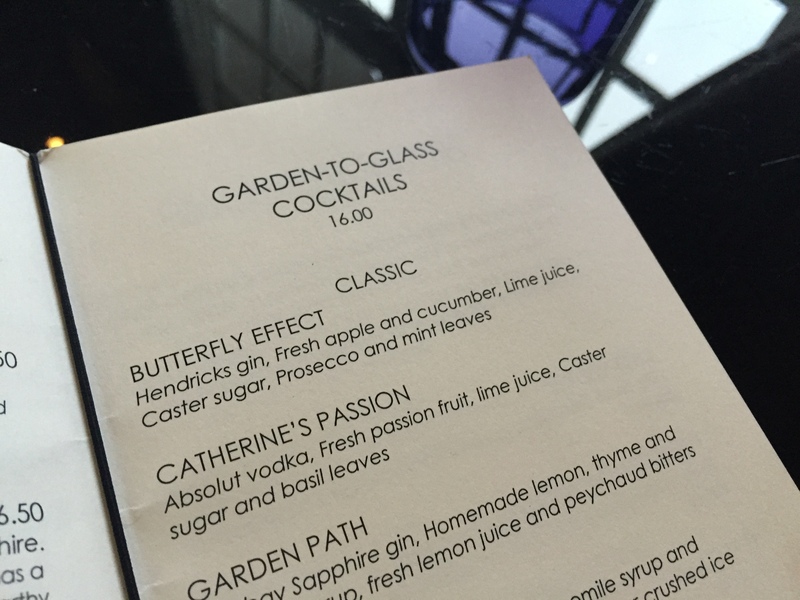 Luxury Restaurant Club Offer savings would have amounted to £62.00 on this bill. Members dine complimentary when enjoying breakfast or dinner in Seasons Monday to Friday and for lunch in The Bistro Monday to Friday and afternoon tea in the library Monday to Friday. For more details click here. For details of how to join The Luxury Restaurant Club for just £95.00 inc. please click here.